As a charitable service program aligned with these organizations, Crime Stoppers acknowledges and truly understands the importance of each local law enforcement agency, and the positive contributions they make to our city. The evening starts off with networking from 5:30 - 6:30 where guests will enjoy Grand Gardens famous Antipasto Bar including assorted meats, cheeses, dips, skewers, shrimp cocktail, etc… but don’t fill up because our networking hour is shortly followed by a 5 Course Meal. 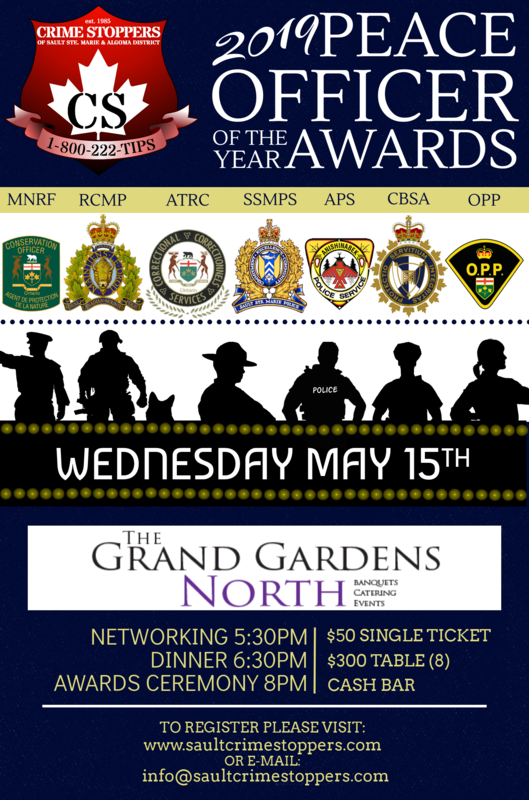 The award ceremony will commence at 8 pm where our Sault Ste. Marie Chief of Police, Hugh Stevenson, will deliver the keynote address.